In this photo I've actually lowered a rope down the chimney flu to "fish out" this juvenile squirrel stuck at the bottom. Squirrels live in chimneys as well as attics. Your chimney is just like a big, hollow tree to some animals. Squirrels are great climbers, and they need a safe, dry place in which to live, so if your chimney has no chimney cap, get ready for some visitors! Female squirrels instinctively seek out high areas in which to create a nest. Because squirrels are so common in urban areas, they often climb on houses and other buildings looking for a good place to set up a nest. If they see an open chimney, that's a great place to pick. They can easily climb down the flue, and they usually set up a nest and have a litter of baby squirrels at the bottom. If you are hearing sounds and noises in the chimney, and you think you have an animal in the chimney or fireplace (it's not too hard to tell) it's most likely either squirrels or raccoons. Squirrels make more noise in the daytime. If a squirrel fell down a slick metal flu like in the above photo, it'll make a lot of frantic scratching noise. DO NOT START A FIRE if you have squirrels in the chimney - you’d have to open the damper to let the smoke out, and they will enter the fireplace instead of climbing out. Even if they don’t get into the your house or fireplace, you will cook animals alive and get a horrendous odor that will last a long time. If you have squirrels in the chimney there's several things you can do. Odor deterrents such as predator urine might work, because it's a very concentrated area, as opposed to a large and well-ventilated chimney. Read more about Will repellents get a squirrel out of the chimney? However, the best is to set a special chimney trap at the top of the flu, which catches the squirrel as it exits. If there's babies inside, they can then be safely removed by hand. You can also set a ground trap at the base of the chimney and do the same thing, though the capture rate may not be 100%, like with the chimney trap. You can scare the mama out and remove the young, then use the young as live bait. Or, you can use a long chimney snare pole to grab and remove them all. 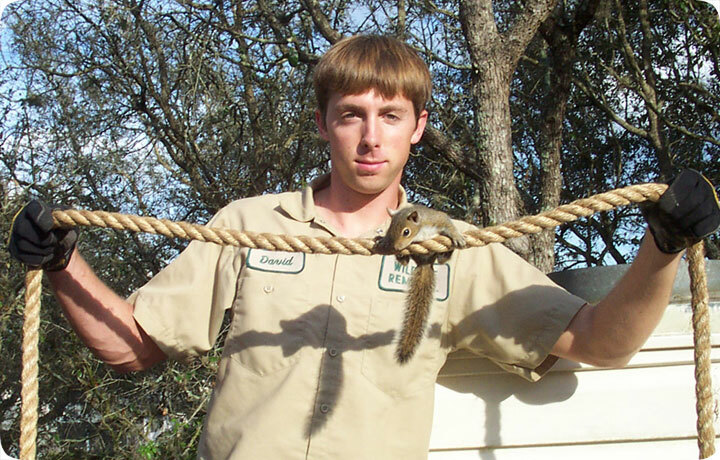 Many professional wildlife removal experts have special squirrel in chimney removal systems if odor deterrents don’t work. Just remember to get the babies as well as the mother! Sometimes the noise is more in the fireplace. Some chimneys have an opening to a cavity around the fireplace, and the squirrels can get stuck in there. This can be a very tough scenario. The rope trick might work, or you might need to cut a hole, more likely from the wall cavity, since a fireplace is made of heavy metal. If you don't, the animal(s) will die there and cause a terrible odor. Read more about What to do about a squirrel in the fireplace. Once all the squirrels are out, install a sturdy steel chimney cap to prevent this from happening again. Oh, and if you don't have a cap right now, make sure the fireplace damper is closed, or else critters may wind up inside your home and not just the chimney. If you have a slick metal flu, such as the one in the above photo, the only solution is to lower a thick rope, with weight tied to the end, all the way down. The squirrel will then be able to climb up. The rope trick can also work with squirrels in the wall, provided you have access to the open top of the wall from the chimney above. Due to requests from readers for competent and honest wildlife professionals to assist with squirrel problems, I have been doing research on the matter, and can confidently recommend companies in these USA cities and towns: - AZ	Phoenix, CA	Los Angeles, CA Oakland, CA San Diego, CA	San Francisco, CA	San Jose, CO	Denver, DC	Washington DC, FL	Boca Raton, FL	Fort Lauderdale, FL	Jacksonville, FL	Miami, FL	Orlando, FL	Tampa, GA	Atlanta, IL	Chicago, IN	Indianapolis, MA	Boston, MD	Baltimore, MI	Detroit, MI	Grand Rapids, MN	Minneapolis, NC	Charlotte, NC	Raleigh, NJ	Newark, NY	Long Island, NY	New York City, OH	Cleveland, OH	Columbus, OH	Cincinnati, OR	Portland, PA	Philadelphia, PA	Pittsburgh, SC	Columbia, TN	Knoxville, TN	Nashville, TX	Austin, TX	Dallas, TX	Fort Worth, TX	San Antonio, VA	Arlington, WA	Seattle, WI	Milwaukee or you can just click my complete squirrel trapper directory for someone in your area. There are a few wild animals that can easily fall down into the chimney - squirrels, rats, raccoons, etc. If the chimney is made of a material that the squirrel (or other animal) can cling on to, such as brickwork, you won’t have a problem. The squirrel can often cling on using its sharp claws and scamper out. In certain states, however, people tend not to have masonry or brickwork in their chimney. Instead, they have metal and round flus, and these make it impossible for the squirrel to break free. You can sometimes open the dampener and let out the squirrel, but you’ll want to make sure you have a live cage trap handy to capture the little beast. If you can’t do this however, you may need to resort to other methods. Never, ever light a fire. You want to rescue and remove the squirrel, not BBQ it. Plus, the smell will linger in your home for days, weeks even, and it won't be pleasant. You could use rope, netting or material lowered down the metal flu. This will give the squirrel something to cling on to, giving it a chance to get itself out and run off. If this method still doesn't result in the squirrel being removed, you may need to call in a wildlife rehabber. They will have extension tools that can safely and humanely remove the squirrel from its trap, releasing it back into the wild again. Once all is said and done, you should take steps to prevent it from happening again. A chimney cap or some wire mesh are simple and easy ways to stop the problem reoccurring. Before carrying on with any attempt to get rid of a squirrel in the chimney what should come into your mind first it to confirm if it’s really a squirrel. Now when you are totally certain that it is then you may go on to remove it. But if you find out that they are trapped and are not able to get out of the chimney, and then you can let them out by lowering down a lot of old clothes, a rope or towels. Just tie them along with these materials such that the animals can be able to climb out. Put a cap on the chimney immediately the squirrel is out. If the squirrel happen to be in the fireplace, it’s very simple to get it rum away by itself; first and fore most lock out all the doors to the entire house, dim all the windows and just make light in the only door which you want the squirrel to use to get out. This is because the squirrel will see the light as the means to escape and run for it therefore opening the door or screen to the fireplace is very important. Nonetheless, you may not need to remove these animals by yourself all the time. Supposing you have the brickwork that they can use to climb in and out of the chimney, the chances of them having lived there some along time are high. Furthermore they might have left too much waste behind so you need to ensure that the entire staff is removed before you begin using your fireplace. However another tip which can be of great help is calling a professional to remove the squirrel reason being they will ensure that they will not attain access anymore and on top of that ensure that your fireplace is all set for use one more thing don’t ever think of start a fire under any circumstances since you may end up cooking both the adult and young squirrels. To some extent, it’s easy for a squirrel to get stuck in your chimney. stuck in the way in which it may not get out hike its way back out after dwindling through one of the reason this kind of wildlife can go into your chimney is of the fact that it’s a very small place where they feel secure, protected from and harm including the weather outside. Well even if these wildlife animals find it contended and enjoyable to live in your chimney, it’s as well very dangerous for them to be there because once the fall inside, getting outside will be very difficult depending on how many walls are in your chimney. However they can stay there for a long period of time since it’s dry and warm in there. Squirrel invasion in any part of your property is a very big problem that you may not like therefore it’s also advisable to prevent this kind of trouble before it happens as discussed above, you may as well use chimney caps that have been of big help to homeowners while dealing with both squirrel and other wildlife problems in the chimney. The good thing about caps is the fact that they are easy to install and they are not costly at all. Caps contain spaces that let the smoke out, although these spaces are too tiny that no unwanted guest can use to get inside.